A monumental work by Veronese. 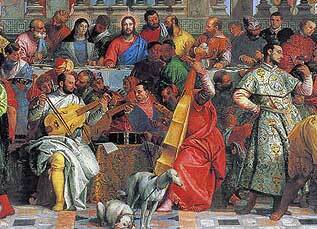 The story of the wedding feast, the marriage at Cana, comes from the New Testament. It tells of Jesus and his disciples attending a wedding at Cana in Galilee. Jesus commanded the servants to fill jugs with water and he then performed his first miracle:- turning the water into wine. This work contains more than 130 figures some of the famous personalities of the day, they include: Eleanor of Austria, the emperor Charles V, Mary of England and Vittoria Colonna. The place of honour is taken by the musicians in the foreground: Veronese painted himself playing the violoncello, Titian is on the double-bass, Tintoretto at the viola and Bassano playing the flute. This painting is a perfect example of the reason that I encourage readers to see art in the flesh. It's impossible to fully appreciate a work of this size (30ft in length) from an image in a book or on a website. If you can imagine the figures in the foreground being life-size then you may have some idea of the scale of the painting. Seeing this in the Louvre also highlights the amount of detail that Veronese has lavished on the picture, the rich colours that he used are a part of the artist's trademark characteristics. The painting hung in the San Giorgio Maggiore Monastery for over 200 years before it was stolen by Napoleon in 1797. During World War II the work was rolled up and moved around France in the back of a truck to save it from being looted (for the second time) by the Nazi's. 2007 was the anniversary of the looting of the painting by Napoleon's troops. Some 210 years after the work was stolen a computerised facsimile was hung in it's original place in the Palladian Refectory. 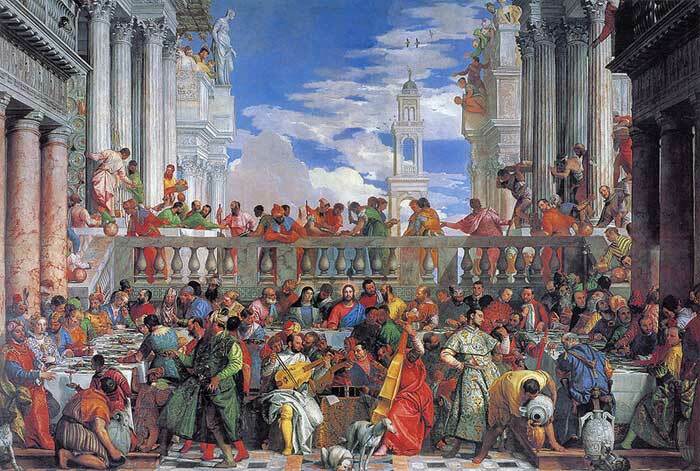 Veronese' Marriage at Cana still resides at the Louvre.